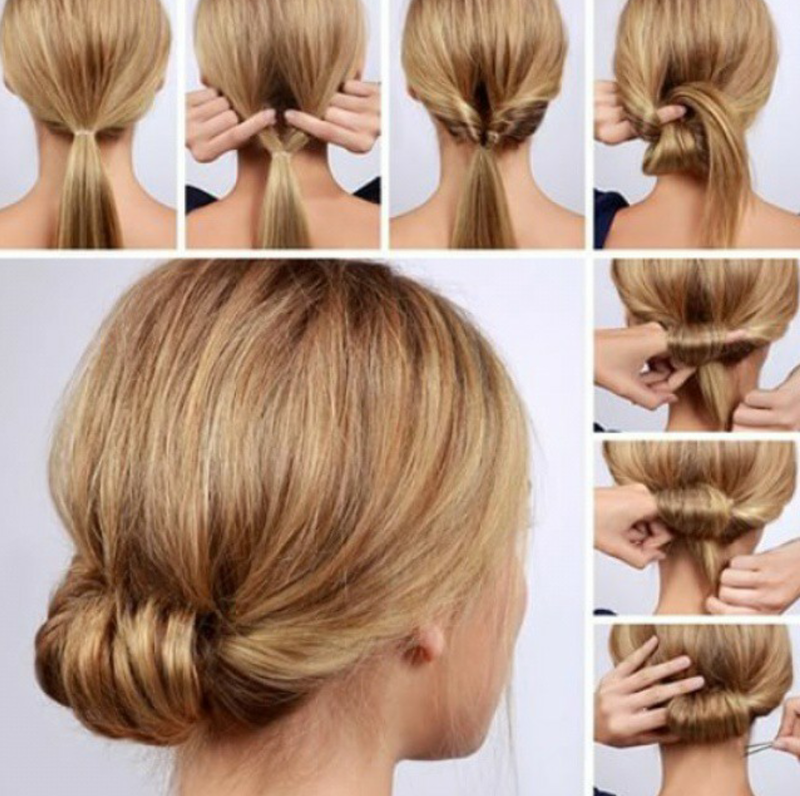 30 Hairstyles for long hair with step by step instructions. This side braid is super cute and now that you have steps is actually quite easy to do. Start braiding on the side while weaving in separate strands of curly locks. Don’t stop until you reach the other end. And voila you now have a beautiful smooth curly hairstyle that everyone will be asking you about. This simple bun can easily be made at home by making two separate braids and knotting them up into a high bun. It is one of the fastest hairstyles to do especially when you are on the go or running late. This nice side braid has that Dutch feel to it and is hairstyle that is perfectly suited to thick Indian hair. The Chignon bun comes from the French. The word “chignon” comes from the French phrase “chignon du cou,” which means nape of the neck. To make the chignon all you need to do is tie up your hair into a ponytail, separate it in the middles and fold your ponytail through. You keep doing this until you have a little roll that looks like a low bun. And that’s it you’re ready to party! So if you are looking for a really quick hairstyle that is also stylish and elegant you should definitely give this one a go. If you have long hair and want to go for a really cute hairstyles you should try this one. I needed to try it a few times before I got it right but in the end I managed. Also, if the hair bow is too much of a good thing for you, you can try tying it up into a messy knot and it will look equally nice. This sadhu style high bun looks very fashionable. It’s also works well on a hot summer’s day. Long hairstyles are a significant sign of beauty in India but sometimes open loose hairstyles can get a bit too sticky and hot. Being able to tie it up while staying stylish is a good way to tackle that long hair when you don’t want it framing you face. This fat fishtail braid looks very hip. For Indian hair it would look particularly nice in a salwar kameez or perhaps some other ethnic clothing. Combine with large round earrings for a stunning entrance. French rolls look extremely elegant. As you can see from the picture they aren’t that complicated to do. You will need to do a few test runs though if this is your first timed. Here is a pretty good tutorial video on how to do a French roll if you want to check it out. This exaggerated puff and updo is perfect for sarees and gowns. To achieve the puff you are going to need to backcomb your hair so that it raises the front part. This high bun can be done by anyone. If you have silky straight hair you will end up with something like in the pic above. If you have slightly frizzier or curlier hair it will still look nice only a little messier. The high bun is a preferred hairstyle by airline stuff. Here we have a rather quirky and cool side ponytail. It’s relatively easy to do and puts a spin on things. These kind of hairstyles are particularly popular in South Korea at the moment. Since they are at the forefront of fashion and leading the way we might have a thing or two to learn from them. Watch this space for 2017! This nice bun roll is comprised of separate braids that meet at the neck. Again an alternative ponytail that will stand out from the crowd. This side swept hairstyle will go very well with a long face and Indian traditional clothes or saree. Combine with a high ponytail to be the star of the show. This cute bun braid can be easily made for you daughter to go to school in. Sometime messy side buns can look very neat as is the case here. The side parting and twirled crown are screaming prom night! Make sure to curl some princess locks with a hair iron if you want that exact look. A classic Alia Bhatt hairdo if you ask me. This is a very nice hairstyle that plays around a lot with texture. It works extremely well with a balayage or dyed streaks. This one is particularly conducive for exercising. This braided bun almost looks like a low chignon. 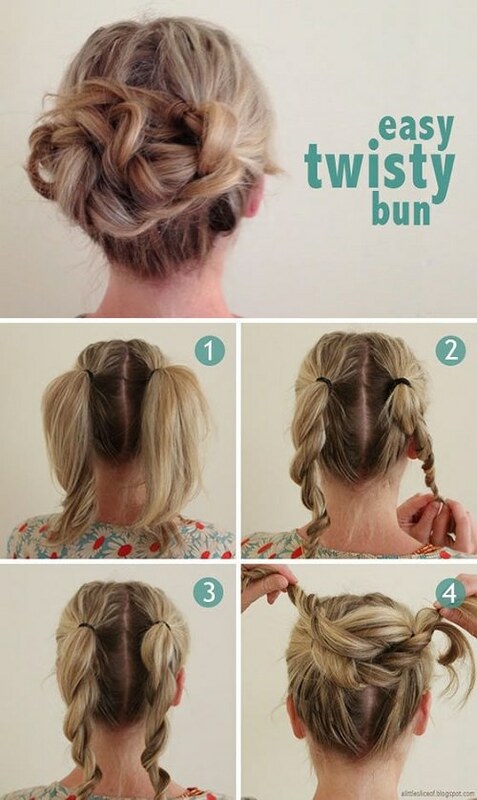 This is one of the cutest hairstyles with step by step instructions that we have found out there. We just love that bow and it’s not too over the top! This hairstyle is very original. Note how the braids on either side have been made so that when they join they meet like two pieces of a puzzle. This hairstyle requires some backcombing as seen in the image but the result is kind of cool. This braided ponytail does not require that much effort. It can easily be made in under 5 minutes. It’s a casual hairstyle that can suit many occasions ranging from a day at the office to a lazy Sunday. These double fishtail braids look super cool. This hairstyle will go very nicely with jeans and western clothes or you could try it with something more ethnic like a salwar kameez. This curly down do looks very neat and pretty. It is also an extremely simple hairstyle to do. This high bun is easy to do and looks like a blossoming flower. 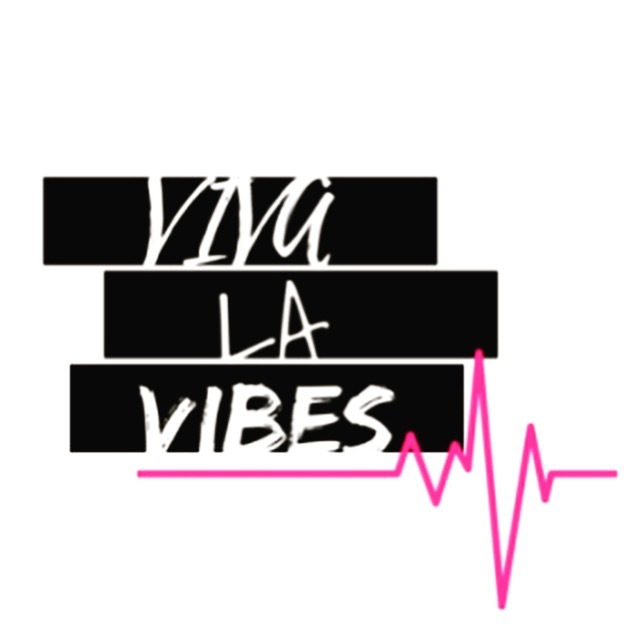 It is also a perfect hairstyle to hit the gym with and it will hold everything in place. This high bun is perfect for silky North Indian hair. Get ready to walk on the red carpet after you are finished doing this one. This intricate bun has so many swirls it looks like the inside of a flower. In fact you could try adding a few flowers if you are going to a reception. Finally, this beautiful pattern is kind of cool and unique. It’s a hairstyle that should take less than a minute to do but it’s not a hairstyle for running around in if that’s your plan. If you enjoyed these hairstyle tutorials you might also want to check out our section on simple hairstyles or take a look at our selection of various hairstyles for girls on Hairstyle Monkey.